A behind-the-scenes look at our accessible document services. At Braille Works, we believe that best-in-class technology is only the beginning. Creating high-quality accessible documents relies on people. For every service we provide, our team begins with a careful analysis of your document and its content. We consider what information is being conveyed and what actions a customer will need to take after engaging with the content. This is the Braille Works Difference–our shared dedication to helping your business become more accessible and Making the World a More Readable Place. Creating a high-quality braille document involves an expert transcription process and top-quality braille embossers. We have both. We start with transcription, analyzing the design elements and content hierarchy of your document, in order to create a braille document that communicates the same information clearly and succinctly. Where appropriate we include a complete table of contents, we provide logical breaks between sections that make the document easier to navigate. Then it’s off to the printers. It is critical that braille dots are uniform across an entire document. Uneven or faint braille dots are like faded or smudged print–they’re impossible to read. At Braille Works we have over 20 of the best braille embossers on site, as well as an inventory of parts and factory trained technicians on staff. These machines are regularly serviced to ensure they continue producing perfectly-shaped braille, even on double-sided braille documents. Learn more about our braille transcription services. Audio is more than words. You might think that an audio document is simply a word-for-word reading and recording of your document, but the truth is a quality audio document requires a plan. We review your document first, breaking down its components to determine the clearest and most effective way to communicate its information through audio. Audio solutions for every content need. There are two options for audio document production. Text-to-speech uses our proprietary script and cutting-edge voice automation software to “read” your document. Our live reader service employs professional readers to create an audio document. You can learn more about audio document options here. We also provide a service for converting documents to a “screen reader friendly” format. This process gives your customers with blindness or low vision an accessible (Section-508 compliant) document they can listen to independently using their PC. Design elements such as certain fonts, use of italics, and color choices can make a document difficult to read for people with visual or reading disabilities. As part of our large print service, we evaluate your document for these trouble spots, then develop solutions that increase readability without sacrificing the content. Aesthetic and branding matter to your business, and they matter to us, too. We have a number of finishing options for large print documents. We are the trusted remediation partner for healthcare, financial, and government industry leaders across the country. 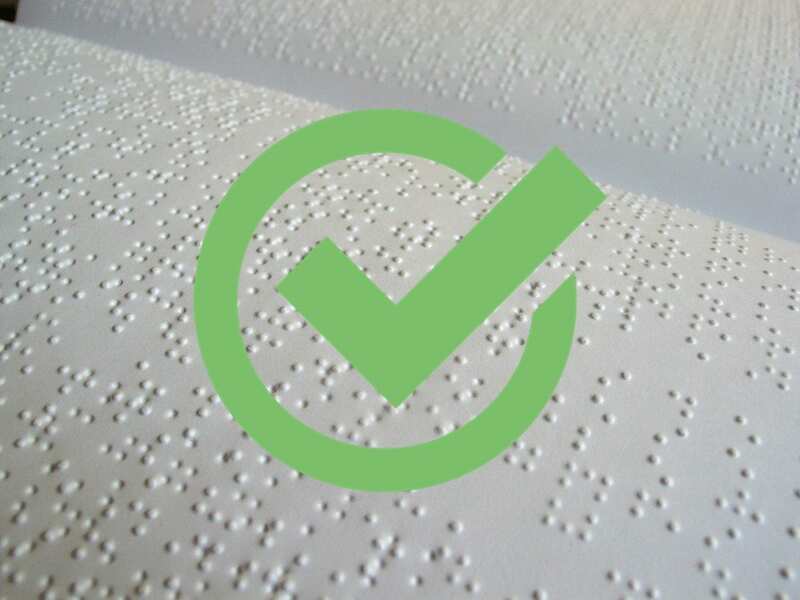 With Braille Works you have a trusted partner that will carefully guard your brand’s reputation and empower your customers with visual and reading disabilities to engage more easily with your business. It’s good for your business, it’s the law, and it’s the right thing to do for your valued customers.